It's time to wrap this up. There's five 15:00 games under way in the Premier League and you can keep in touch with them here. "We want to see that more often from him. He is one of a few players that can help us by contributing more goals. "That tackle (where Knockaert was given a yellow card) was absolutely not a red card." "If Florin Andone plays then you don't know how he would have done but Murray is someone used to this level of games and to see him back scoring is great. "He's been unlucky and missed chances but you hope that if he continues to get them then he will put them away." "I always maintained 40 points is the easiest and obvious one to look for. "It's something to aim for and every team wants to surpass that. "We have two wins on the spin and we've not had many back-to-back wins this season and we can try and make that three." "I feel very disappointed. I think for 90 minutes we controlled the game but in the end they scored from two shots. "Nobody can say we didn't try or create, but sometimes in football these things happen. That's football and that's why it's the most beautiful game. "Brighton defended very well and we didn't have too many clear-cut chances. "They defended well and we need to give them credit for that." "We are going to try and reach semi-finals to bring fans to Wembley and we have a week to train for that one." "It’s a manly performance and particularly after conceding that goal in the second half, the place was rocking and they had all of the momentum. "I haven’t seen the penalty again and I’ve been told it was clear-cut. "I’m more about the teams’ reaction to that.It could have gone the other way but it didn't and we stuck at it and scored two great goals." Crystal Palace boss Roy Hodgson, speaking to MOTD: "It's a hard defeat to take but we came across a team that got players behind the ball. "We gave it our best effort. We pushed players forward at all times. Brighton worked very hard for their victory. "I'd like to think we have got enough in terms of quality in the team but we have missed an opportunity. This was an opportunity to really move ourselves away from any fear of relegation. We didn't take it." "I got drafted in just before the game after Florin Andone felt his groin go in the warm-up, and it was nice to get the goal." "The 100 goals and things like that don't bother me, it's something to look back on but I'm just delighted to get the three points." He's just called it a 'manly performance'. Much more from the Brighton boss in a few moments. Anthony Knockaert's finish went top corner, it went right in the top corner off the post. It was an amazing finish and it was fitting of their performance, they worked so hard, it was a typical Chris Hughton team effort. Crystal Palace have taken 13 points from a possible 45 at home. Fortunately, they're away to Watford in the FA Cup quarter-final next week. Brighton forward Glenn Murray, who was down to start as a substitute but was promoted to the starting line-up after an injury to Florin Andone, tells MOTD: "I know the drill and I'm delighted to get the goal. It was the perfect away performance. I like scoring anywhere." 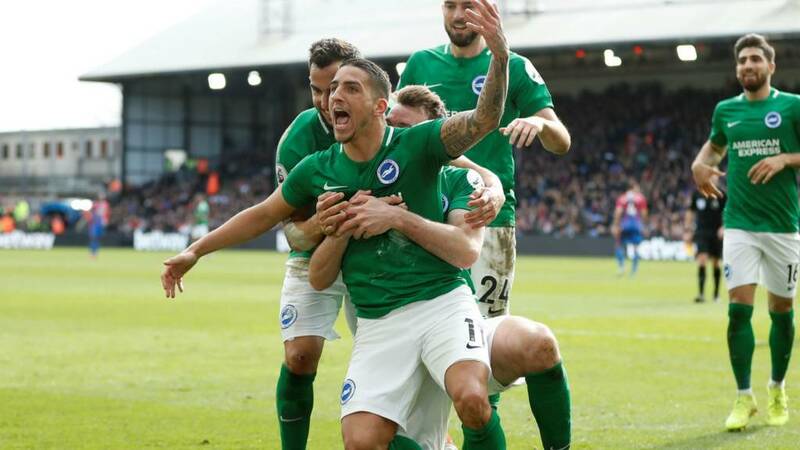 Brighton goal hero Anthony Knockaert has just described the result as a "special day for us and the fans". Robin Smit: Zaha is like a petulant child when it comes to the game, when things don't go his away or gets fouled, such a negative role model to young children out there. Palace will be mightily disappointed in the first goal they conceded. They finished the first half strongly and got their reward in the second and you thought the momentum would be in their favour but they didn't really capitalise on it. Knockaert's strike was unstoppable and from then on the shape and defensive organisation from Brighton frustrated Crystal Palace. Great scenes in the away end. Anthony Knockaert, Yves Bissouma and Lewis Dunk are performing some sort of dance in front of Brighton's delirious fans. Knockaert hands his shirt to a lucky fan. Meanwhile, Chris Hughton is on the pitch shaking hands with all his players. They're heading back down the A23 with three points. Glenn Murray's 35-year-old legs take him deep into Palace's half before he runs out of steam and the hosts win back possession. Seconds left. Brighton are making a change. Jurgen Locadia is on. It inadvertently deflected off of Zaha,the ball bounced up and Schlupp was waiting for that ball to come down but he was leaning back and his shot flies over the crossbar. What a big moment that was. Huge chance for Jeffrey Schlupp inside Brighton's penalty area but he gets his angles all wrong. Mat Ryan is booked for time wasting. Four minutes of stoppage time.